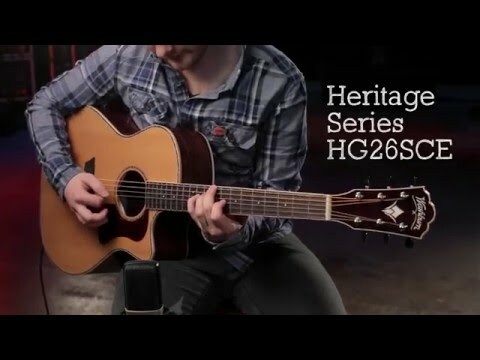 The HG26SCE is a Grand Auditorium acoustic guitar with cutaway for superior upper fret access. It features a solid Western Red Cedar top for sublime tone that improves with age, Santos rosewood back and sides, a mahogany neck with a Ovankol fingerboard and bridge, diecast tuners with stylish ebonite buttons for quick, easy and accurate tuning, a Washburn tortoise pickguard and an abalone rosette. The HG26SCE is the classic blend of Cedar and Ovankol. Because it's a bit smaller than a dreadnought, it's more articulate and ideal for fingerstyle players. It is, however, both full and clear. Thanks to its built in Fisman Presys+ 301T Tuner/Preamp, you'll never need to carry around an extra tuner. The preamp features volume, bass and treble control for natural amplified acoustic tone, plus a phase switch to deal with feedback issues. The HD20S is a classic dreadnought acoustic guitar. It features a solid spruce top for superior tone that improves with age, Santo Rosewood back and sides, a mahogany neck with a Ovankol fingerboard and bridge, die-cast tuners with stylish ebonite buttons for quick, easy and accurate tuning, a Washburn tortoise pick-guard and a custom rosette. The HD20S is the classic blend of spruce and Ovankol perfectly suited to bluegrass flat picking and hard strumming. It is both full but clear and articulate. Dreadnought w/solid Sitka spruce top, Pau Ferro back and sides and Fishman electronics.